Below is a Press Release from Bonham’s Auction house. 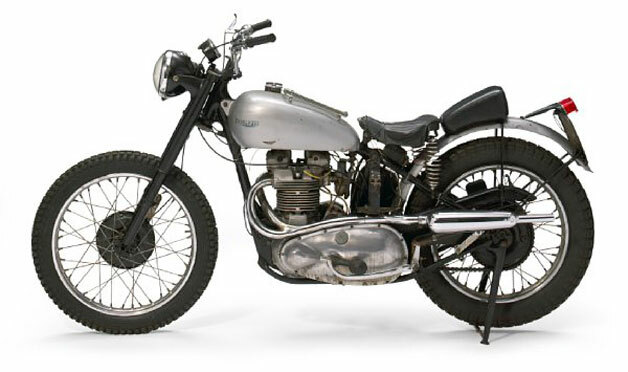 The 1949 Triumph Trophy TR5 Scrambler Custom ridden by The Fonz in the television hit series Happy Days will be one of the highlights at Bonhams’ upcoming Classic California Sale in Los Angeles. Happy Days, the beloved American sitcom that aired for ten years from 1974 to 1984 and attracted millions of viewers each week, helped launched the career of such actors as Ron Howard, Scott Baio and Henry Winkler. Winkler’s character, Arthur Fonzarelli – known famously as The Fonz and Fonzie – was initially just a secondary character that became so popular with fans he was soon made the central figure of the show. As the epitome of cool, the motorcycle-loving Fonzie, dressed in the stereotypical garb of The Wild Ones, spawned countless wannabes among the youth of America and became a cultural icon that still resonates today. And Fonzie’s motorcycle, a customized Triumph, was owned off-screen by another cultural icon, Bud Ekins. The late Bud Ekins was famous as a motocross racer, Hollywood stuntman (he’s the one that made that legendary motorcycle jump over the barbed wire fence in The Great Escape), and as Steve McQueen’s best friend. With his warehouse of hundreds of motorbikes, Ekins was the go-to man in Hollywood when producers needed two wheels. So when the people from Happy Days called, it was Ekins who determined what the coolest guy on TV should be riding. Taking an old Triumph in his collection, he simply removed the front fender, replaced the handle bars and spray painted the tank silver and, violá, the Fonzie bike was born. Of course, no one had any idea of just how popular the show would become or the magnitude of fame Winkler’s character would achieve. This now iconic emblem of American pop culture will be offered by Bonhams at their annual Classic California Sale, held November 12th, at the Petersen Automotive Museum in Los Angeles. Renowned for offering property from famous actors each year – Steve McQueen, Charles Bronson, Clark Gable and Bruce Willis, to name just a few – this autumn auction is not to be missed by aficionados of pop and custom culture and entertainment and automotive history.